Since its launch in October 2013 the combined waterway transport service NORD PORTS SHUTTLE (NPS) has continued to grow. Originally plying between Dunkirk, Lille LCT and Dourges LDCT, the service had already been extended to the port of Béthune last November. Now Valenciennes is connected to the regional waterway container transport network. Since 7 May, a motorised barge with 48 TEU capacity has linked Dunkirk's container terminal (Flanders Terminal) to one of the inland port terminals of Valenciennes (Anzin). This new service will of course serve the other Valenciennes terminals. The retail giant La Redoute, which manages its furnishing goods in the Anzin platform's wharfside warehouses, is one of the first clients to use this service. Commenting on this choice, the Supply Chain manager Gonzague Dalle said: "In all, more than 150 containers have already been switched from road to waterway in the last two weeks. The adoption of waterway transport solutions, causing less pollution, is fully in line with our environmental strategy which includes a guideline for significant improvement in the field of goods transport." Meshing the Hauts-de-France Region with local consolidated transport services, contributing to the steady decarbonisation of logistics systems and helping to decongest the regional road network, is the main priority of NORLINK PORTS. 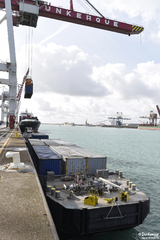 This association, which brings together the 4 sea ports and 20 inland ports and platforms of the Hauts-de-France, promotes the Region's harbour infrastructures and works towards closer cooperation between the ports on the seaboard and the inland ports, collectively making the most of the logistics opportunities of the Hauts-de-France. Said Bruno Fontaine, President de NORLINK PORTS: "The deployment of this waterway shuttle from Dunkirk to Valenciennes testifies to the new synergies between the ports of the Hauts-de-France. It also contributes to our goal of promoting road-alternative transport systems. I am delighted with the NPS service, which supports and allows business growth for regional companies in all our ports. The action of NORLINK PORTS will continue in this direction." Stéphane Raison, CEO of Dunkerque-Port, added: "The combined transport plan of the port of Dunkirk has been boosted by an essential waterway link. It now connects Dunkirk's container terminal with the Valenciennes area, providing a new decarbonised transport alternative for the many industrial and distribution firms of this major economic sector of our Region." And Ferenc Szilágyi, President of NORD PORTS SHUTTLE, commented: "Waterway container transport offers many advantages: an approach that is environmentally-friendly and responsible, and logistics that are unrestricted and reliable because waterway transport has no traffic jams. Combined waterway and road transport is also good for local employment: the vessels sail under the French flag and NPS uses local companies for the final delivery. Local and made in France!"